Microsoft is the world leader in cloud technology, business systems, and office software. When embarking on our journey to build Thread, Microsoft was the only partner we considered. Microsoft Azure gives us a scalable global platform. It also delivers on the promise of security, compliance, and data protection. All of which are essential in order to provide our clients with a best-in-class legal practice management tool. Once Thread is set up you can access it from your desktop, tablet, at meetings, at court – anywhere with everything at your fingertips. And always under the protection of Microsoft. Free yourself to work how you want. You benefit from our continuous development. New features will be seamlessly added as we enhance the product. And our web-help is there to answer all your answers. Thread knows how you work. Keep things where you need them, and where you can easily find them - sync your data, file scanned docs, instant time capture. Manage your cases from one platform. No case limit. No hardware maintenance. No escalating fees. You only pay for the number of users you need. Get a higher return on investment on your time and energy. Can you afford to operate without it? 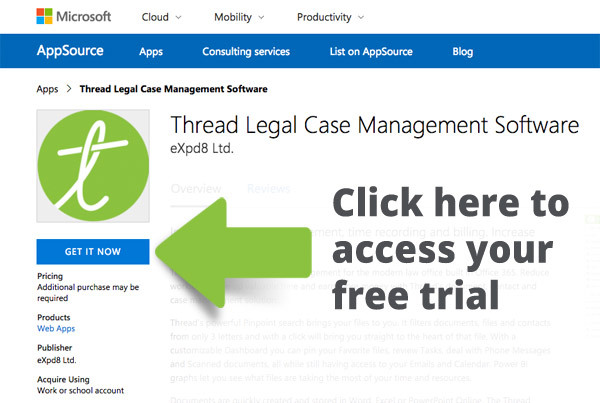 Thread is the missing piece of Office 365 for lawyers.